Some Recent Testimonials from our Office Album. 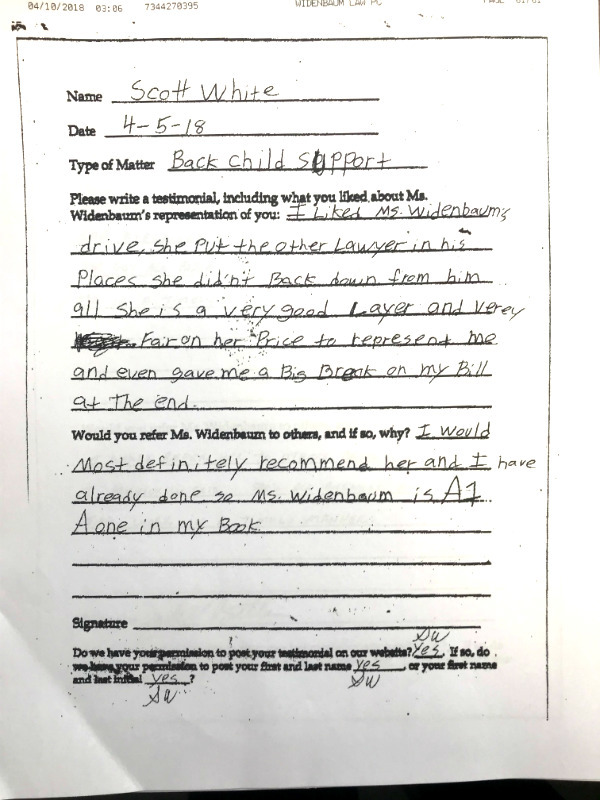 to review with complete names. They are abbreviated on the internet for privacy purposes. Susan Widenbaum did a great job of keeping us informed of the bankruptcy process and made us feel at ease. 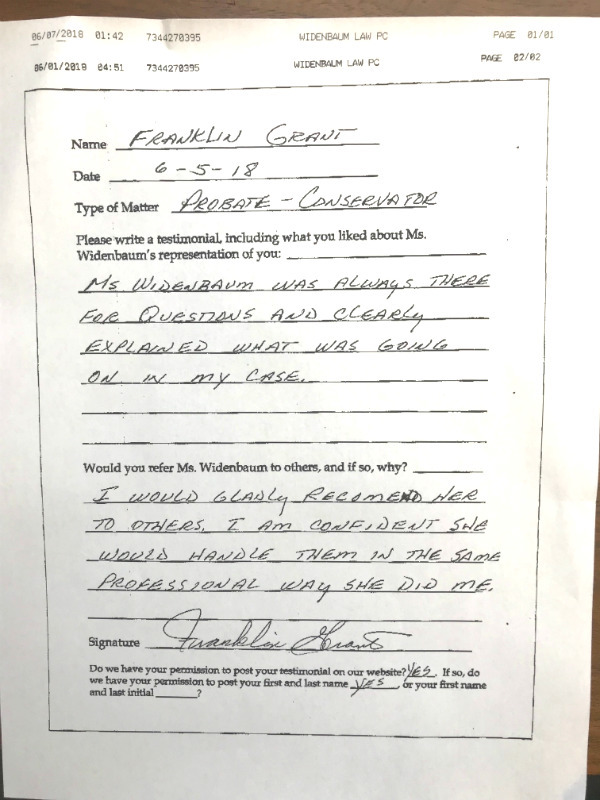 I would recommend Ms. Widenbaum because she is very good at what she does and she cares about her clients and their concerns. 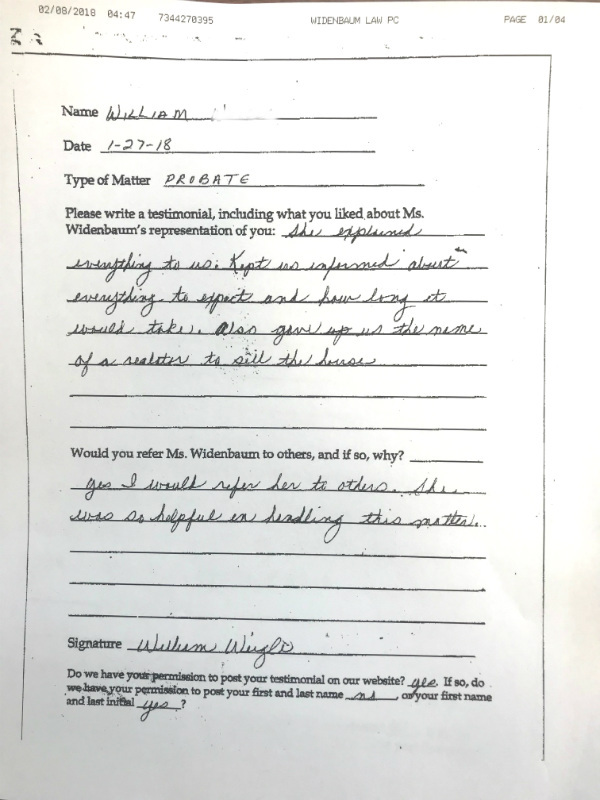 Ms. Widenbaum assisted me with handling my brother’s estate. Her professionalism made me feel so comfortable. 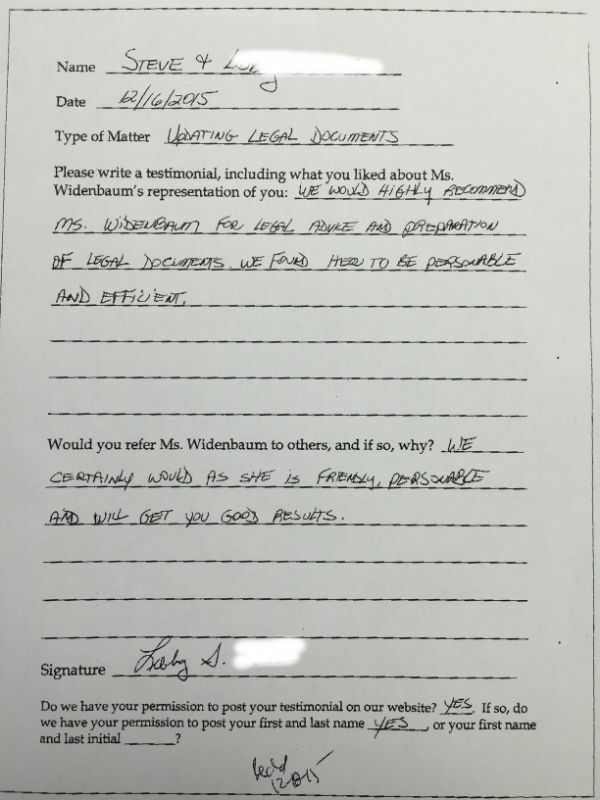 Ms. Widenbaum is great, she knows the law, answers all questions you may have and returns your calls promptly. I’m very happy to have found her. 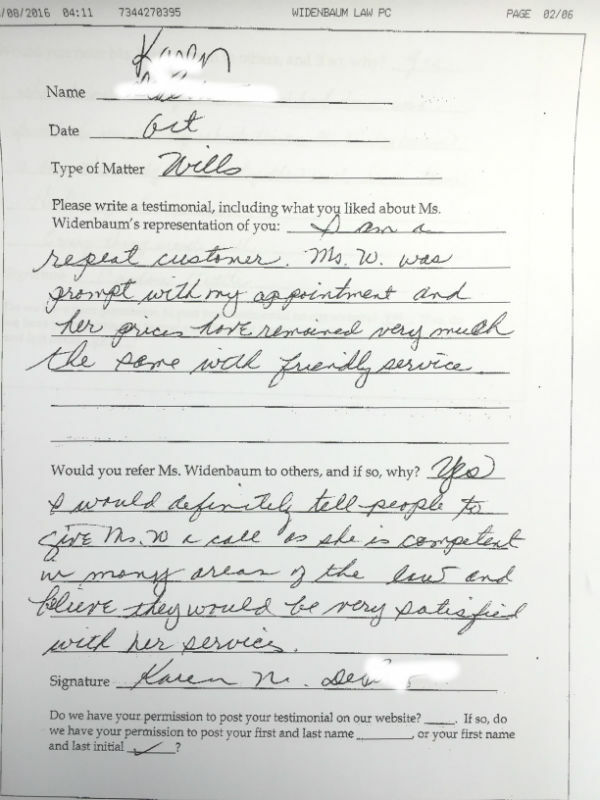 Ms. Widenbaum is as professional and personable as one could anticipate. 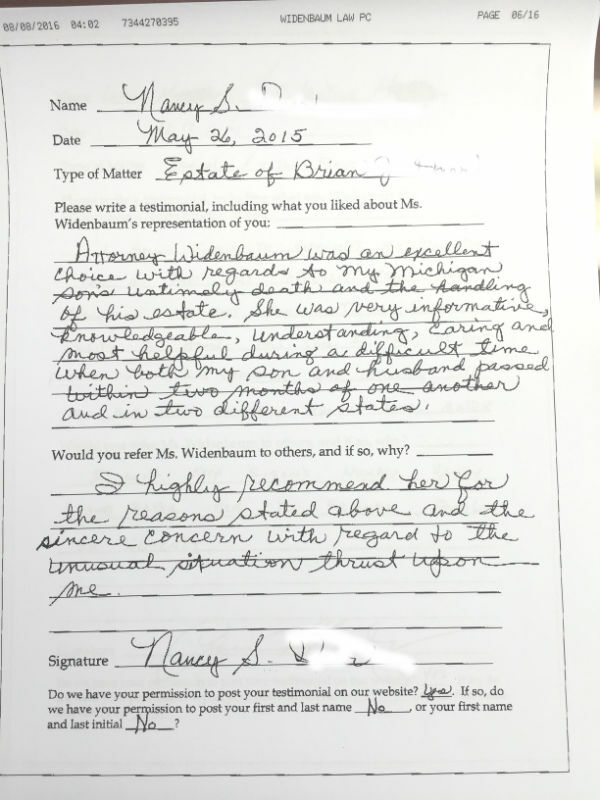 Atty Widenbaum’s honesty and aggressiveness in her representation of my concerns left no doubt that she was the right one for the job!! 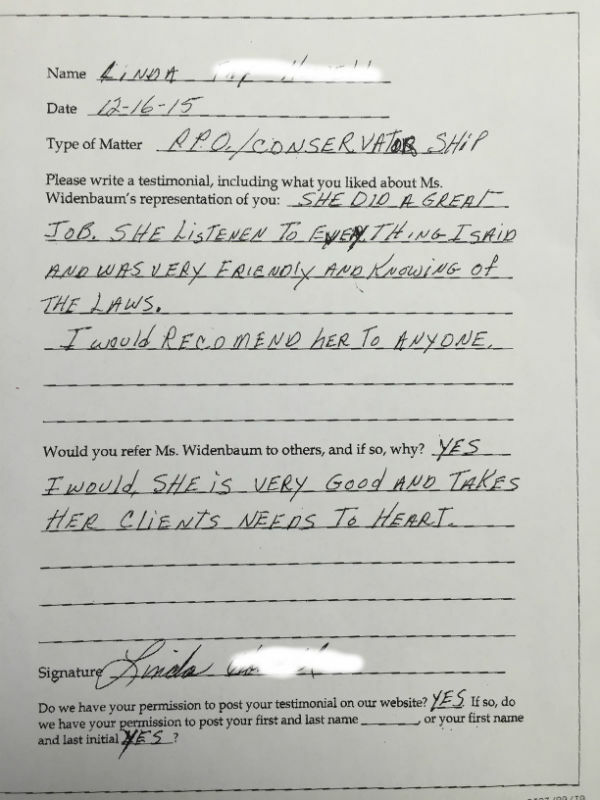 I found Susan Widenbaum very professional and responsive in every way. She looked out for my interests at all times, and answered all of my questions. 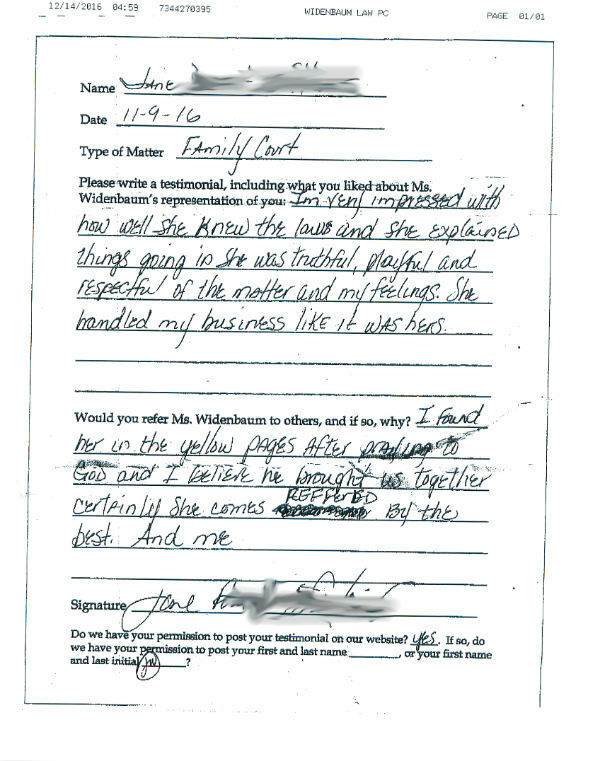 I felt very secure in her care and confident of the results. She took her time to explain every little detail without feeling that I was asking silly questions. She also made me fell comfortable during every meeting and she is very detail oriented. 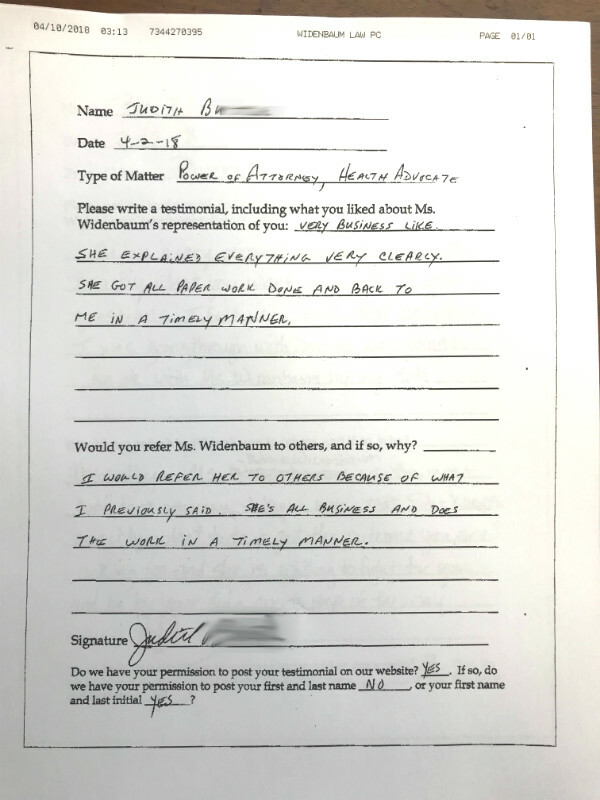 Terrific experience with Mrs. Widenbaum as my attorney during my bankruptcy. She went above and beyond what was called for. She was professional while being caring and helpful. Took care of everything in advance so that I didn’t have anything to worry about when I walked into court. I was literally in and out of the courtroom in 10 or 15 minutes and most of that was waiting to be seen! I can not say enough great things about her or her staff. Would recommend her to anyone and have done so to my family and friends who need an excellent attorney. 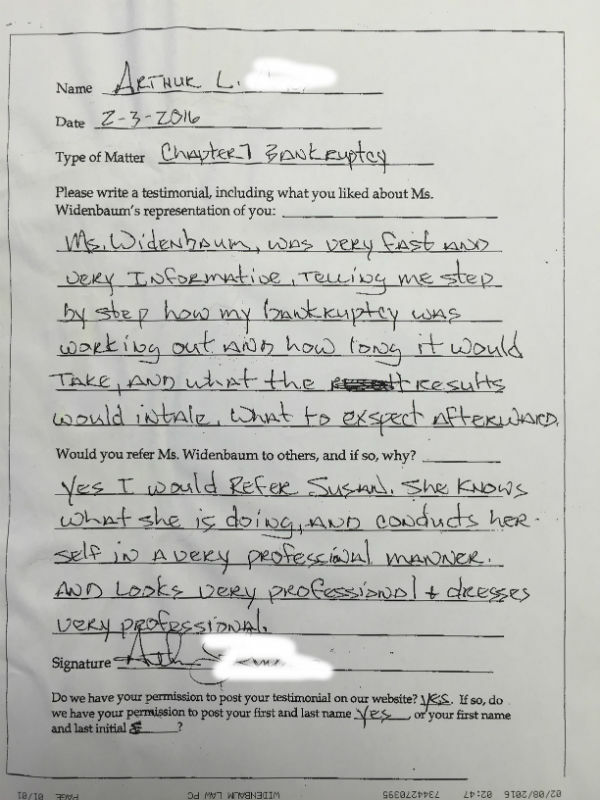 I loved how Ms. Widenbaum treated us like we mattered, not like we were just another “client” during our bankruptcy. She made us feel comfortable with what we were doing and how we were doing it. She is the best. I would refer everyone to Ms. Widenbaum. She took excellent care of us during this matter. She made a scary situation a lot easier. Excellent representation during marathon negotiations. Her performance was appropriate, extremely professional, and always in my best interests. Restores my belief in our judicial system, and speaks well for her negotiating skills and persistence. I feel fortunate to having her represent me during the difficulties. 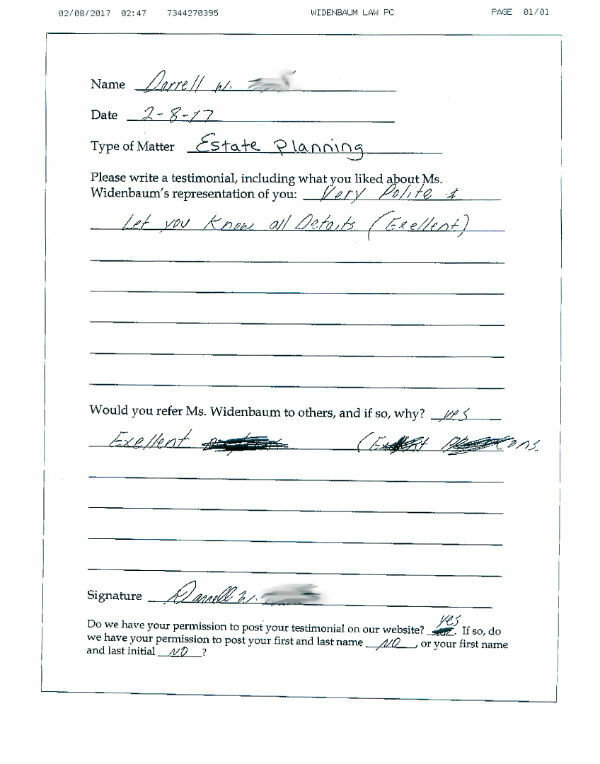 We are very pleased with Susan Widenbaum’s services. We have been using her for many years. She has been very honest with us, saved us money, and explained everything to us. 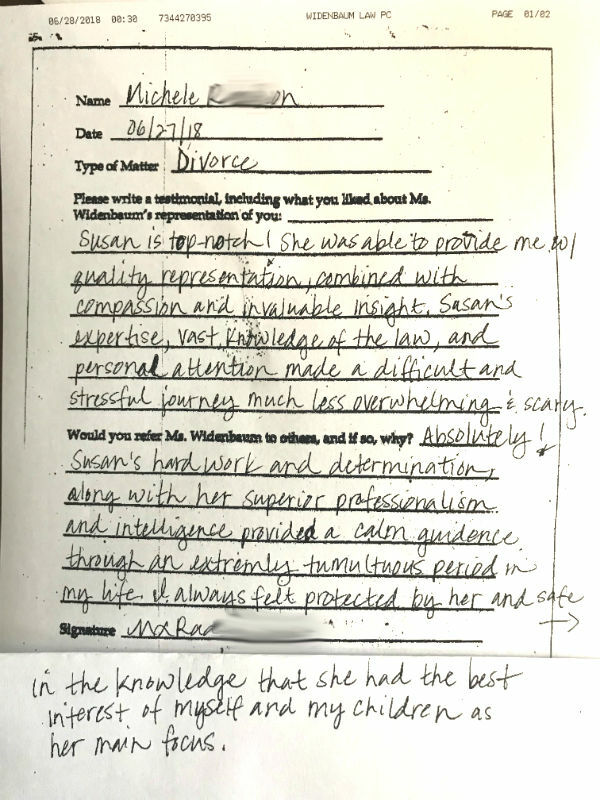 Susan did a great job handling my divorce. She was there for me during this very difficult time and helped me through the whole process. 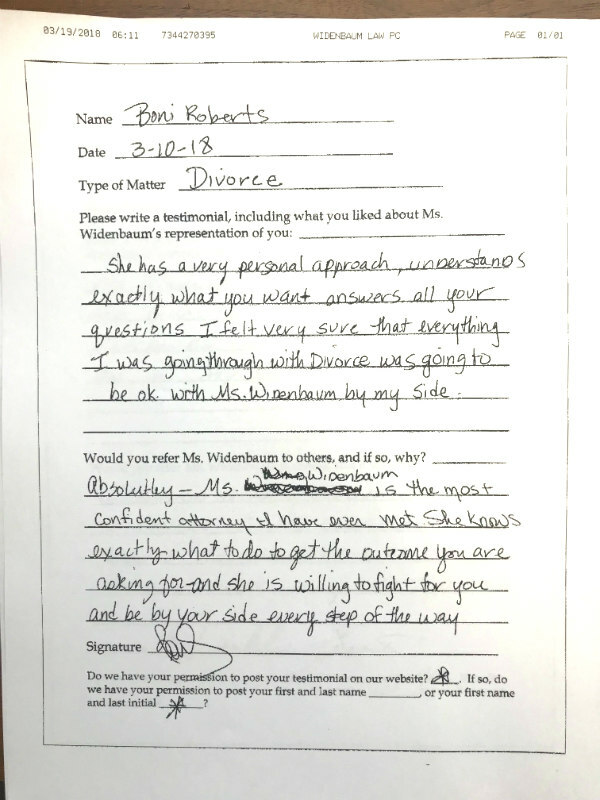 She told me in the initial interview she had handled over 3500 divorces, and she proved it by how smoothly it went. She was passionate in representing my interests, and she made herself available to handle all of my questions. I would definitely use her again! 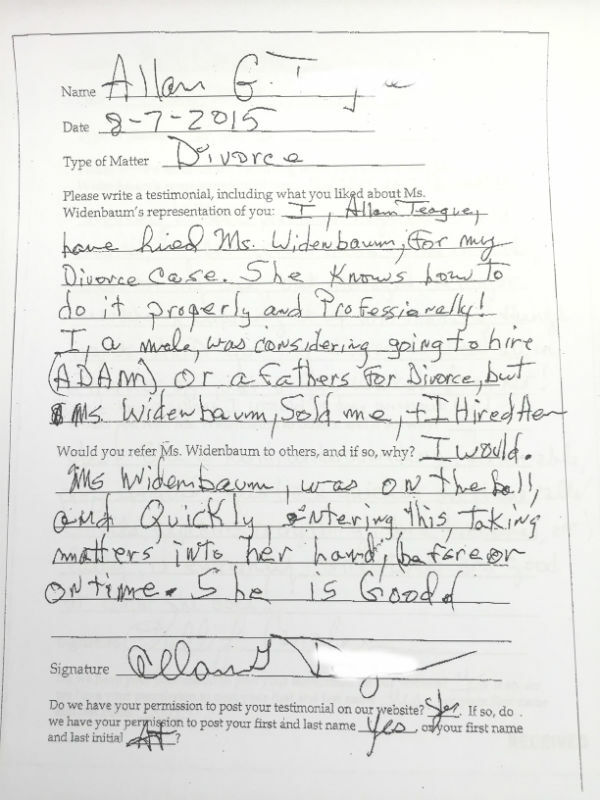 Ms. Widenbaum was very professional and direct in all areas of my divorce. She will definitely be referred by me in the future. She was always prepared and was always there whenever I had questions about anything. 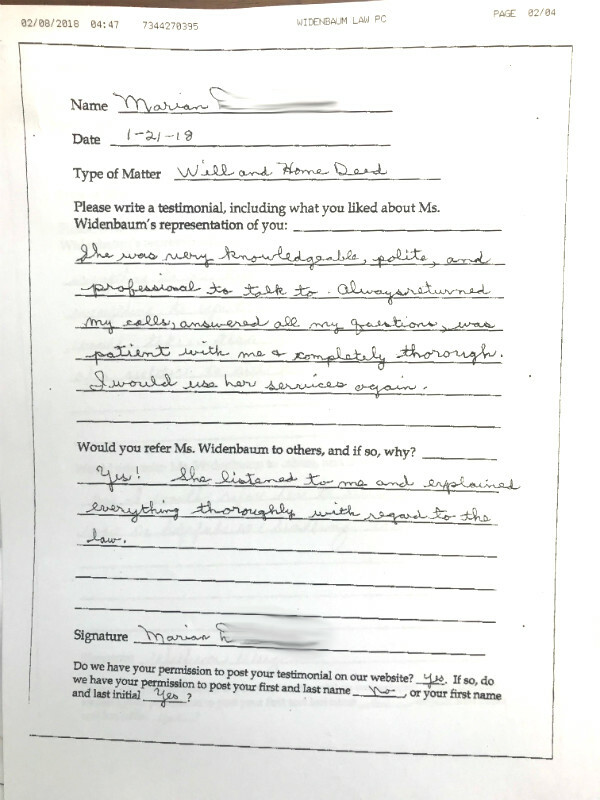 Ms. Widenbaum was very understanding to my issues, and fought very agressively for my rights. She had a gret deal of concern for my situation. 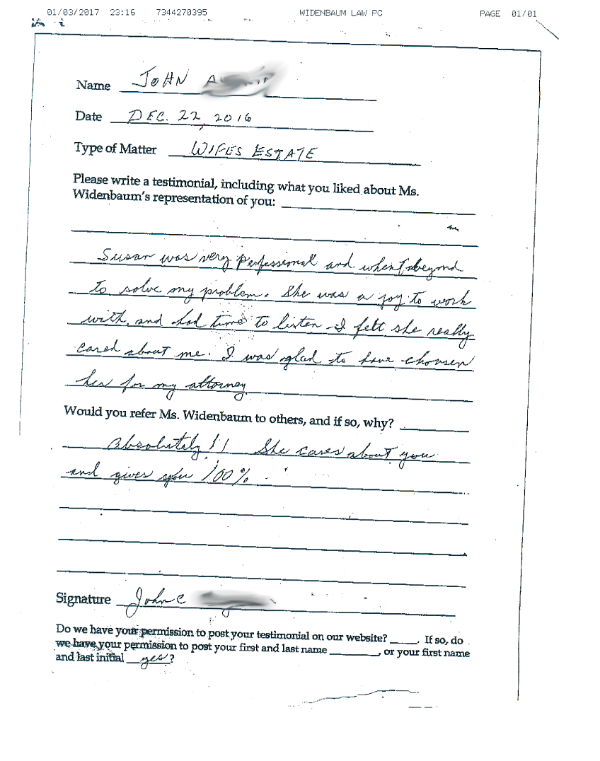 I was very satisfied with the professionalism and personal touch combined from this attorney and staff. It is difficult to combine both but this office manages to do it without any difficulty. You are given from day one the freedom of contact for any question or problem that arises. 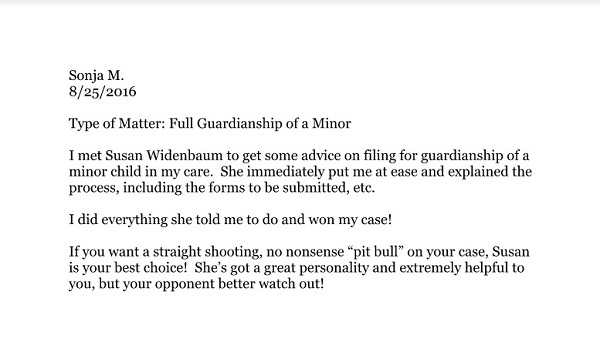 I would highly recommend Susan Widenbaum to all friends and family if the need for legal assistance should arise.